I am a dreamer at heart. There. I’ve admitted it. I’ve tried to deny this for years, doing the practical things humans do, fretting about getting good grades and finding the right mate and how to keep a roof over my head and food on my table, marching in painfully uncomfortable lockstep with the other grownups. I put that uniform on when I need to—food and shelter are not to be sneezed at—but the wool itches and the vest constricts my breathing and let’s not talk about how the crotch rides up on those ridiculous trousers. 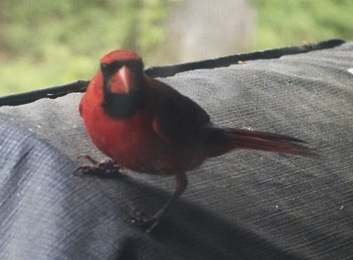 Right about the time I began to worry whether I’d let the uniform become a permanent part of my epithelial cells, sort of like a Simpsons character, this weird little cardinal started attacking my back deck. Male Northern cardinals do this sort of thing, I’ve heard. They are territorial, especially during brooding season, and when they see their own reflections in shiny things like windows and car mirrors, they think it’s a rival bird and attack. Over and over and over again. I did the things people suggested to make him not see his reflection. Decals on the windows, dangling distracting strips of things from the glass…everything short of covering the sliders with white sheets, which the spouse nixed. I’d rather have a thumping cardinal than a husband grumbly that the lack of natural light coming into the house might kill his cacti. And his mood. Eight months later, well past normal brooding season, he’s still flinging his winter-fluffed body into my windows. But in the beginning, my little dreaming heart wanted to tell stories and make meaning out of it. My first flight into the nature of his arrival was that he had come to teach me something. About perseverance, perhaps. Or how to survive getting hit on the head over and over and over again, a common way of life for freelancers and indie authors. Then I attempted communing with him. While waiting for my coffee to brew in the mornings, I’d inch up to the window, watching the proud set of his banged-up beak, the determination in his shining black eyes. He liked the sound of my voice, or at least did not fly away from it. At this point, Husband considered that I might need professional help, or a hobby, but I ignored him. Instead, I went deeper and imagined his story. I let him tell it from his point of view. In the first, he had come to save me from my itchy, semi-permanent uniform, a sort of cage I’d locked myself into and did not realize I could leave. Next, and I admit I might have been a little loopy that day, maybe from the repeated percussion of a determined cardinal banging up my house, he’d been sent by a Disney princess to be one of those magical cleaning birds but was continually frustrated that he couldn’t get inside the window. I latched wholeheartedly onto the next theory, relayed to me by several Facebook friends. Some say that an appearance of a cardinal means that you are getting a message from a loved one who has died. Then I was all about what the message might be. From my mother-in-law, watching over us? Telling me to clean the house and fretting that my husband is too thin? A friend who likes that we’ve hung one of his paintings in the hall and hopes we’re happy? Someone else? Don’t get me wrong; I appreciate the love from beyond, but those windows are going to need some serious power washing come spring. Aww, that touched me. Regardless if there is a message in napoleon’s persistent presence I think it can still be helpful to think about it that way. It gets the creative and introspective juices flowing. Thank you, Yvonne. He does inspire me. “At this point, Husband considered that I might need professional help, or a hobby, but I ignored him.”—Haha, loved that line. I hate wool too. 🙂 Maybe Napoleon is telling you to try something different? Perhaps to tell his story in a way children will love, and adults too. Perhaps he wants you to give /his/ story a happy ending somehow. 🙂 Whatever it is, fly lady, fly. I love cardinals! We have a number that hang out in the trees at our house. I’ve heard that cardinals are loved ones watching over us. Whatever the motive behind Napoleon’s actions, he’s a gorgeous boy. Maybe he thinks you’re keeping his mate in the house and he wants you to set her free?